On 1 June 1815 one of Napoleon Bonaparte's most faithful servants, Marshal Berthier, chief-of-staff of the army, died after falling from a window in unclear circumstances. Until now little was known of his private life and his psychological profile: Franck Favier has filled this gap, with his recent biography of Berthier, “the shadow of the Emperor”, published by Editions Perrin in 2015. Using the personal archive of the Berthier family, Favier reveals for the first time the personality of the discrete Marshal beyond his prowess in military logistics. Winner of the Fondation Napoléon First Empire History Prize this year, Favier has kindly answered three questions for napoleon.org. Interview by Irène Delage, November 2015. Irène Delage: “L’ombre de Napoléon” [The Shadow of Napoleon], the sub-title of your biography of Marshal Berthier, underlines how little we know about Berthier. What portrait have you drawn of him; where did he come from, who was he? FRANCK FAVIER: Louis Alexandre Berthier is a central character in the epic of Napoleon, not only because of his role beside Napoleon and his position at the heart of the imperial regime, but also because of his origins, which make him, in the Emperor's own words, “l'homme de Versailles” [the man of Versailles]. In fact, he was the first child of Jean Baptiste Berthier, (the geographical engineer of Louis XV and the head of the service of geographical engineers of the King until 1772), and of Marie Françoise Lhuillier de la Serre, the chambermaid of the Count of Provence. The Berthiers were ennobled in 1763, having rapidly climbed the social ladder (Berthier's grandfather, Michel Berthier, had been the servant of a Burgundy noble) and quickly established themselves close to the royal family. Louis-Alexandre, born in 1753, participated in the American Revolutionary War with the likes of Rochambeau, La Fayette, Lauzun, and de Broglie. Here, he was able to make important friendships and networks, which would go on to save his life during the Revolution and would help him to keep his elite status during the formation of the nobility of the First Empire, many of whom were members of the Ancien Regime. Berthier the Marshal therefore existed well before and without Napoleon. He was a rock of a man, with a reputation for being loyal to his friends. He was also renowned for his great organisational skills, which brought him into the headquarters of some of the most important generals, such as Custine, just before the Revolution and subsequently. Irène Delage: Berthier’s loyalty to Napoleon has never been questioned, least of all by Napoleon himself. What united the two men? FRANCK FAVIER: They first met on 25 March, 1796 at Antibes [the Mediterranean resort in the Alpes-Maritimes department of south-eastern France]. Despite the age difference (sixteen years), there seemed to be an immediate affinity between the two men, notably their opinions on the military art and their shared drive to work for the victory of the Republic. Thanks to Berthier's prodigious memory and pragmatism, he was able to impress his director by the way he responded to his questions. Thus began a formidable partnership that would last eighteen years, functioning on the basis that Bonaparte, later to be the Emperor, would act as Commander and receive the fame and glory, while Berthier would concern himself with the execution of Napoleon's orders and work in his shadow. The extent of Berthier's military action would be the role of a devoted Chief of staff, characterised by his acute intelligence as much as by his immense capacity for work. Berthier would henceforth be at Napoleon's side at all campaigns, taking his orders day and night. The two men travelled together and even slept close by, in neighbouring bivouacs. During the Empire's brief moments of peace, Berthier's role as the Grand Veneur de France would lead him again to Napoleon's side during the imperial hunts. However, it would not be appropriate to call the two men friends. Berthier was profoundly loyal and filled with immense admiration for the Emperor, though his feelings were somewhat dulled after Napoleon's increasingly poor treatment of him from 1812 onwards. As for Napoleon, he never really understood Berthier. He thought of his chief of staff as insipid and two-dimensional, even doubting his interest in this man for anything but his military work. And yet, Napoleon could not go without Berthier, lavishing him with honours and endowments, and making him one of the richest men of the Empire. In 1809, Napoleon made Berthier the Prince of Wagram, giving him the domain of Chambord as a dotation. Their relationship was primarily dominant/submissive. Nonetheless, Berthier tried to keep hold of his independence in his private life. In 1796, he fell in love with the Marquise Visconti, who was to be his mistress for the duration of the Empire, despite the Emperor's disapproval. And even if Napoleon forced him to marry a Bavarian princess in 1808, Berthier made it so that his mistress and wife could get on and live under the same roof, to the Emperor's fury. Irène Delage: You are also a specialist of Swedish history and have written a remarkable biography on Bernadotte. Now, you are writing about Berthier. How do you approach the art of the historical biography? And more specifically, what difficulties did you come across during your research on Berthier? FRANCK FAVIER: I imagined my two biographies in slightly different ways. The one about Bernadotte was the culmination of twenty years of work on the relationship between France and Sweden during the Revolution and the First Empire in the context of a Masters, and then a PhD. Therefore, I saw the biography of Bernadotte as a depiction of a man in his own time, both in terms of his French career between 1780 and 1810, and in terms of his reign over Sweden until 1844. It had seemed to me that, even if he was well known in this first period, there would still be plenty to say about his reign in Sweden, which was one of the most fruitful periods in Swedish history and which did much for the emergence of the Nordic model. My research took me to Stockholm for the Archives Royales, London for the Public Record Office, and also to Paris for the Ministry of Foreign Affairs Archives. As for Berthier, my train of thought was slightly different. It had always struck me that there was so little research on this character, as if modern thought denied him any active participation in the success of the Emperor, in comparison to many other Marshals, including Davout and Murat. 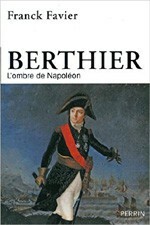 Of course, there exist two very respectable biographies of Berthier, but one of them, that of General Derrécagaix, is fairly old and focuses on military aspects, while the second, by Jérôme Zieseniss, does not deal with Berthier's strong family advantages, nor his family's social climbing. Therefore, my research was based on the private archives of the Berthiers deposited in the Archives Nationales (173bis AP), which comprises almost 449 boxes. I also used Berthier's travel diaries from America and Prussia, of which the Archives Nationales have copies. Additionally, I found it important to try to develop a more detailed picture of the man through the memoirs of his contemporaries. Drawing up a portrait of a Marshal, however, was not always easy; the accounts by generals Thiébault and Lejeune almost contradict themselves. Gauging the essence of a man is always difficult, if not impossible. In the case of Berthier, the man living in the shadow of the Emperor during his campaigns, he can appear on the one hand very secretive and meticulous, for example in his war-related responsibilities, but also, susceptible to sometimes adolescent fervours, including his passion for the Marquise Visconti and fits of jealousy with the Emperor. Furthermore, the Berthier of 1814, torn between conflicting loyalties, a hero straight out of Corneille, so brilliantly portrayed by Aragon in «La Semaine sainte», heading towards an extraordinary death for the time, could not but fascinate a historian. As my teacher, Jean Tulard, often said, the difficulty in the art of biography is managing to remain detached from the subject, being able to pursue an enquiry, both for and against, like a lawyer. This is what I have tried to do in writing these two books. I hope it comes over to the reader.